Bought online for $280, brand new and never worn. This skirt is a must see! 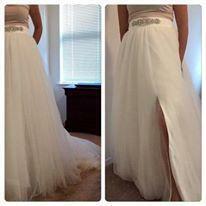 Ivory in color, 4 layers of tulle, with a small slit in the front, and a gorgeous train in the back. Beautiful embellishment at the waist, and buttons to hide the zipper. Waist is a size 30/32 and easily tailor-able. Great for dressing up a pair of jeans or wearing to a wedding with a skirt. MUST SEE: STUNNING BLACK EVENING/COCKTAIL DRESS! !